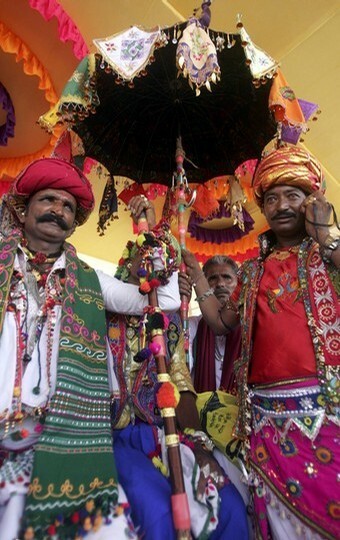 Tarnetar fair, the most colorful and vibrant fair of Gujarat, is held this year on August 23 to 25 th. Tarnetar is located in Saurashtra near Thangadh. It is five hr drive from Ahmedabad via Limdi-185kms approximately. The fair is held near Trinetrashwar Mahadeva temple at Tarnetar. Grampanchayat and various state authorites organised this colourful fair known as tribal fair near the temple and kund site. Most of the tribes of Saurashtra like Bharvad, Rabari, Koli etc are participating in this fair in a big numbers. The special feature of the fair is matchmaking between the youth of Kolis, Bharwads and Rabaris. It is believed that the Svayamvar of the panchal princess Draupadi was held here wherein Arjuna won her hand .Even today,the tradition of Svayamvar continues and the tribal girls attending the fair have a right to choose their husbands from the assembled youth. The youth come attired in exquisite cloths and jewellery with ornate umbrellas, which signifies that they are ready for a matrimonial alliance.